I recently had my first trip to Menchie’s (an awesome frozen yogurt place) and tasted their cake batter yogurt….soo good! Of course, I already knew I loved cake batter because I lick all the bowls and spoons when I bake. This is why I don’t have kids, because then I’d have to share–just kidding =). After 3 trips to Menchie’s in 1 week, I started looking for other cake batter desserts and apparently the cake batter thing was pretty popular a couple years ago-especially among bloggers. 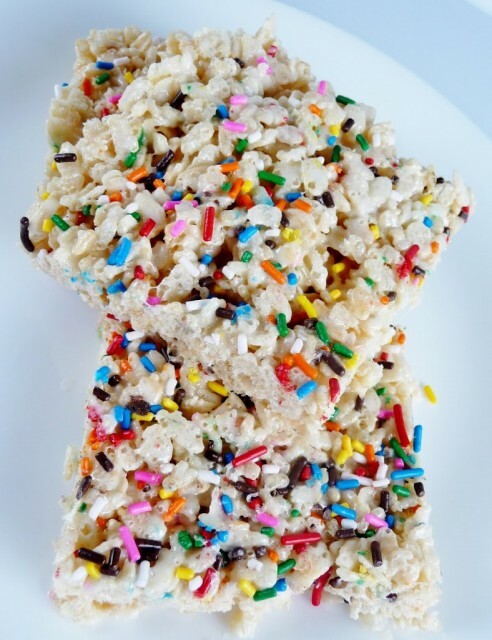 I found lots of recipes for cake batter rice krispies treats. All of them were pretty similar with varying amounts of rice krispies, marshmallows, butter, and cake mix. I added sprinkles just because who doesn’t love rainbow sprinkles? And stuff tastes better if it looks pretty. You eat it first with your eyes… right? These are super easy since you melt the marshmallows in the microwave, so they only take about 5 minutes to mix up. I think they’d be good with other flavors of cake mix too, maybe strawberry or red velvet. The cake batter flavor is subtle and honestly, I don’t know if I could have even told you they were cake batter. It’s just a little something to make people wonder… “hmm, what is that?”. Enjoy! Melt butter in microwave safe bowl. Add marshmallows and mix until well coated. Microwave marshmallows until well melted (about 1 minute). Stir in cake mix. Add rice krispies and 2 tbsp of sprinkles. Stir until well combined. Pour into greased 9×13 pan. Press down lightly and top with remaining sprinkles.